Following approval from the city of Santa Monica, Uber is deploying bikes and its first set of scooters via JUMP, the bike-share startup it acquired earlier this year. Although these are Xiaomi Ninebot scooters, Uber says it’s branding them with JUMP for the sake of consistency when it comes to its personal electric vehicle services. “JUMP is a leader in this space. People have grown to know, love and appreciate the quality of the product that JUMP offers and we’re building on that brand equity — investing further, and that was one of the major drivers,” Uber Scooter Product Manager Rhea Dookeran told TechCrunch. As part of the pilot program, Uber can have up to 500 bikes and 250 scooters on the streets at any one time. Riders must also be sure to stay within the service area of Santa Monica, and not venture out into the broader Los Angeles area. Otherwise, they’ll be fined. But Uber is not operating the only electric scooter service in Santa Monica. In mid September, Lyft launched electric scooters in Santa Monica just a couple of weeks after the company deployed them in Denver, Colo. In addition to Uber/JUMP and Lyft, both Bird and Lime operate electric scooters in Santa Monica. Through October 7, Uber’s JUMP scooters will be free. After that, the scooters cost $1 to unlock and then 15 cents per minute after the first five minutes. Before your first ride you must upload a photo of your driver’s license. At the end of each ride, you’ll have to take a photo of where you parked the scooter. Unlike other scooter startups, Uber will rely on its own employees to collect the scooters at night, charge them overnight and then re-deploy them in the morning. Last month, Uber made it easier to switch between traditional rides, scooters and bikes — functionality that is making it possible for Uber to deploy electric scooters today. 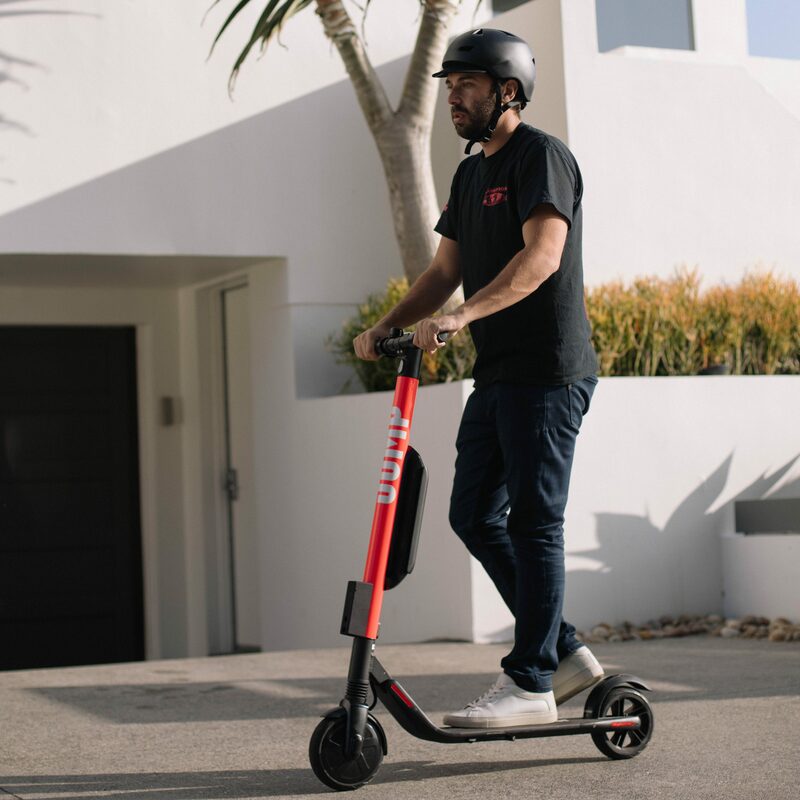 That move came after Uber in July put some money behind its ambitions to get into scooters when it participated in a $335 million funding round in Lime. Moving forward, Uber is looking to launch electric scooters in additional U.S. cities this year. Uber also expects to fully integrate Lime’s electric scooters into its offering by the end of the year. Over in San Francisco, we’re expecting to see electric scooters hit the streets again in a couple of weeks. Uber/JUMP, however, will not be one of them.